Nerf Rebelle Fearless Fire Blaster Was $35 Now Only $10! You are here: Home / Great Deals / Christmas Deals / Nerf Rebelle Fearless Fire Blaster Was $35 Now Only $10! Check out the fantastic deal on the extremely popular Nerf Blaster! 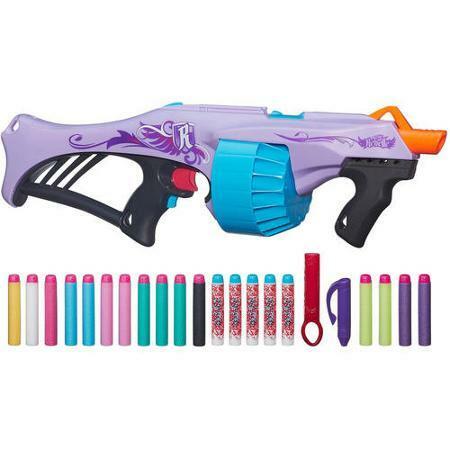 Head over to Walmart and order the Nerf Rebelle Fearless Fire Blaster which Was $35 and is Now Only $10! You save $25!! Let your daughter train like her new favorite heros; Katniss Everdeen of the Hunger Games or Tris from the Divergent series! Shipping is FREE on orders of $50+ or you can opt for FREE store pickup!! Take aim for undercover missions and secrets with the Fearless Fire blaster! With this powerful motorized blaster, you can rapid-fire 20 darts without reloading with the acceleration button. You can launch 20 darts in 10 seconds at targets up to 75 feet (22 meters) away! But this blaster lets you be sneaky too. You can write and send secrets in plain sight with the Message Darts, special pen and decoder. You’ll be the super-spy with style on the battlefield with the Fearless Fire blaster!